IP Automation engineers and manufactures a full spectrum of high-performance railroad industry equipment. Designed and fabricated with expert custom machining, our railroad maintenance equipment is efficient as well as easily maneuverable. Click on each heading to view a YouTube video of each product. IP Automation’s latest railroad maintenance machine is our tie drilling and spiking station. Designed for one of our major railroad customers, it quickly and safely drills holes in railroad crossties. 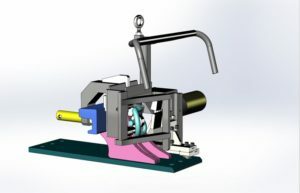 The automatic machinery includes a vacuum system functional with various wood tie lengths. IP Automation’s Safelok III manual clipper tool for railroad maintenance is designed to safely, quickly and easily install Safelok III rail clips on to the rail. This clipper tool is light weight and easy to use, requiring minimal effort and storage space. IP Automation’s Safelok I and III retaining clip staging tool for railroad maintenance installs, stages or removes Safelok I and III two rail clips simultaneously. Connected using two hydraulic hoses, an external power pack supplies the machine’s hydraulic power. The Safelok’s innovative CAM design eliminates the need for electronic controlled components, reducing the machine’s complexity and increasing its reliability. 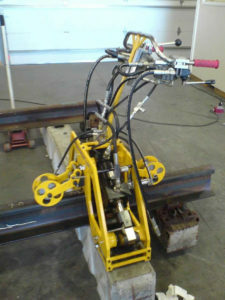 Wheels incorporated into the machine facilitate movement between rail ties. Operated by three hydraulic hand controls, the Safelok is easily maneuvered by a single operator. The single operator E-clip installation tool includes two hydraulic hand controls, one for raising and lowering the unit, the other for activating the clip installers. The hydraulic unit easily pushes the retaining clip into place, installing two clips simultaneously on both sides of the rail. Once installed, the unit raises up and rolls to the next eye. Most importantly, the clipper does not overdrive the clip installation and meets the AREMA 3/8′ gap requirement. IP Auto Safelock I and III Clipper maintenance tool installs 3-stage clips at approximately 3 seconds per tie on both sides of the rail, providing high efficiency performance. The hydraulic arms expand wide enough to allow clearance to roll the unit quickly and safely to the next tie for the next clipping action. The unit is operated with ease by a single lever hand control. At 150 pounds, the IP Automation Safelock I and III clipper maintenance tool is lightweight and easily maneuvered by a single operator. Two conveniently located handles on the side of the machine allow for trouble-free relocation by two maintenance personnel. The IP Automation rail anchor clipper quickly and safely installs a pre-staged anchor under the rail through the ballast rock with a single hydraulic action. For further information about IP Automation’s railroad industry machining, please see Railroad Industry Engineering & Production.